NASA put May at 1.67°F (0.93°C) warmer than the 1951-1980 average for the month, the first month since October 2015 to be less than 1.8 degrees Fahrenheit above average in their dataset, which extends back to 1880. To show how much the average temperature of the planet has warmed since preindustrial times, Climate Central reanalyzed both datasets, averaging together the NOAA and NASA temperatures and comparing them to those from the period 1881-1910. 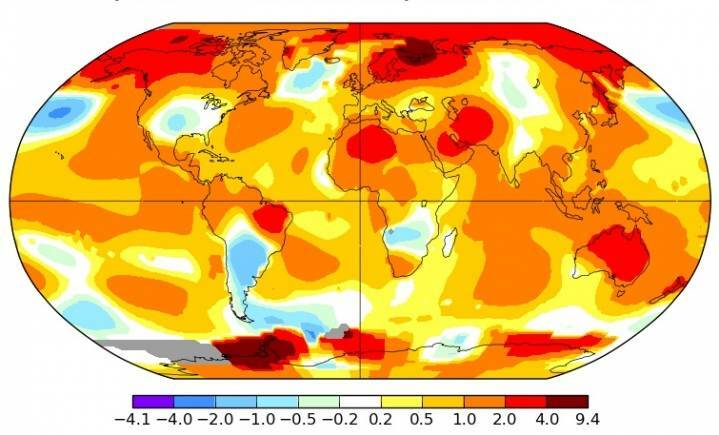 Through April, the global average temperature was 2.6 degrees Fahrenheit above the average from that earlier period. Nations have agreed to limit carbon dioxide emissions to keep warming under 2 degrees Celsius (4 degrees Fahrenheit) by the end of the century, but have discussed trying to achieve an even more ambitious target of 1.5 degrees Celsius (3 degrees Fahrenheit).